Chocolate and chips? How un-savoury! If, like us, you’re a fan of the film Chocolat, you’ll recall how Juliette Binoche’s character Vianne knocks the socks off birthday party guests with a roast chicken in chocolate sauce, which is devoured in stunned silence by those lucky enough to be tucking in. Dark chocolate can be added to garlic, onion, tomato sauce, chilli and spices to make a fantastic barbecue sauce for chicken and indeed all types of meat. The sauce – and variations on it – is known as mole (pronounced mole-ay), which originated in Mexico early in the colonial period. Legend has it that upon hearing that an archbishop was going to visit, convent nuns in the state of Puebla went into a panic because they had nothing to feed him. After bringing together what they did have, chilli peppers, spices, day-old bread, nuts, and chocolate, they killed and cooked an old turkey and smothered it in the sauce they’d made from the thrown-together ingredients. 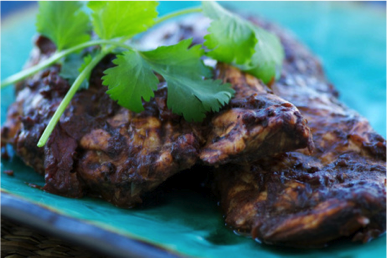 The archbishop loved it and mole has been enjoyed ever since as one of the most respected ceremonial dishes in Mexico. It’s worth pointing out that, unlike the chocolate and chips combo we mentioned at the start, mole and dark chocolate in most cooked dishes provides a subtle silkiness, rather than the strong cocoa taste that you’d expect from your favourite chocolate bar. Which we think is much easier on the palate! We’d love to know your thoughts on savoury chocolate combinations. Have you tried chocolate with chips? 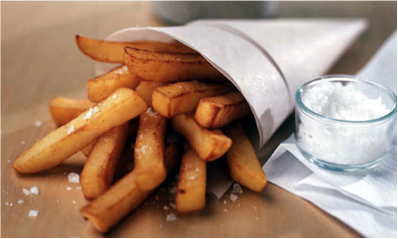 Do any other savoury chocolate dishes hit the spot for you, or do they get your tastebuds in a twist? It really makes us smile as we used to live in the next village, just outside Paris, to Johnny Depp, who starred in both films. We even shopped at the same supermarket as his wife, but despite our best efforts we never bumped into the famous couple. Recently, we were talking with a customer about not meeting Johnny, when we realised that we had also lived near our favourite chocolatey author, Road Dahl, when we lived close to Aylesbury. Written in 1964 this classic novel is such a beloved story that it’s been made into a film twice, and later this year into a West End musical. 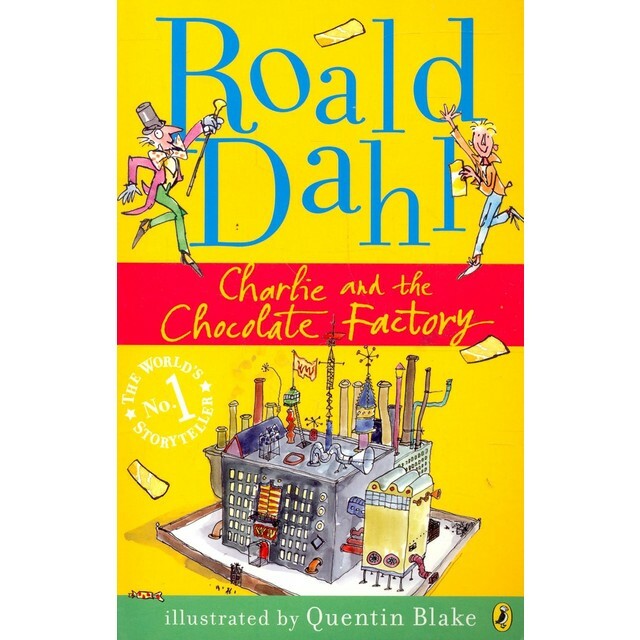 Roald Dahl’s love of chocolate, possibly stems from Cadbury using his school for market research and to test new products; they sent samples to the pupils so that they could get feedback from the eager pupils. We don’t know of any school that does this anymore so it’s no good trying to find one for your children, but perhaps you might want to go to see the musical instead. 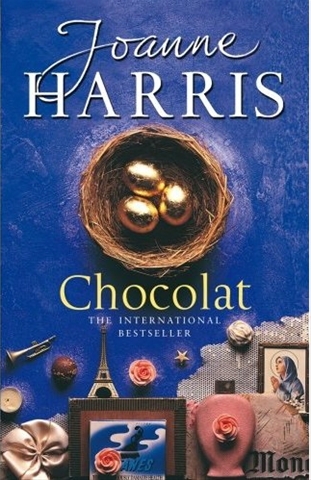 Chocolat was first a best selling book written in 1999 and then into a film in 2000. It’s the story of young, single mother, played by Juilette Binoche, who arrives in the French village of Lansquenet and opens a chocolate boutique directly opposite the church at the beginning of Lent. Initially met with opposition, the shop proceeds to gently change the lives of the villagers who visit her chocolaterie with a combination of sympathy, subversion and a little magic. An amazing story that is testimony to the magic of chocolat! It’s a short list, but we hope you agree that each book and film has it’s charms. Perfect for snuggling up with on a cold, wet weekend with a few chocolate buttons to make you feel that you are really part of the story. 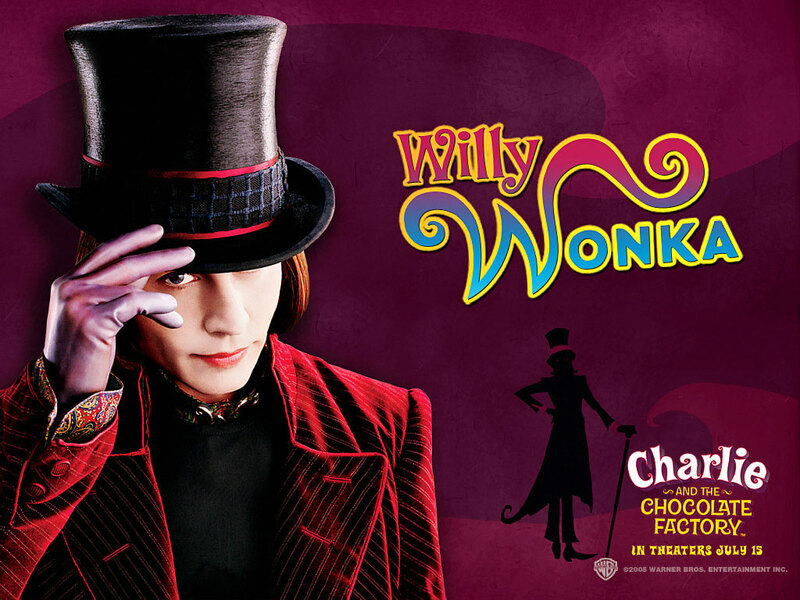 Finally, we often get asked which of the two Willy Wonka films we prefer, for the moment that’s a secret, but which is yours? When you enter our little shop in the centre of Cambridge, the smell of chocolate wafts through the air and you are surrounded by trays of alluring pralines and truffles tempting you to eat them. In the window, our chocolatier is skillfully making our famous sheet chocolate for everyone to see. Everyday we get asked by customers where they learn how to make their own handmade chocolates too. At the suggestion of a customer we decided to start our own chocolate course, and 3 years later hundreds of chocolat lovers have discovered, not only the joys of making their own handmade truffles, but how easy it is as well. On the course, before we dive into the actual chocolate making, we talk a bit about the history and theory of chocolate. We discuss the taste and flavour of some the familiar and more exotic varieties that are available. And of course, no chocolate course would be complete without the all important tasting. We sample Single Orgin chocolates from around the world and see if your palette can distinguish the differences. Next comes the making. First, our chocolatier shows how to make a ganache, one of the most versatile chocolate recipes around. 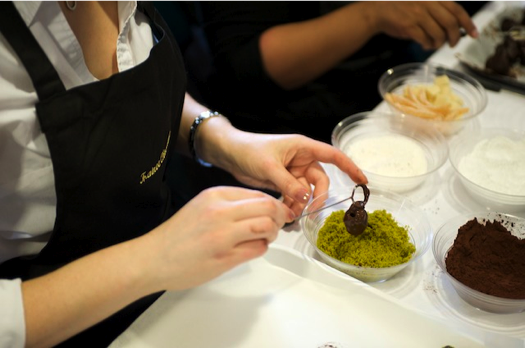 Then everyone gets to make and flavour their very own handmade, fresh, luxury truffles. Proving, even an amateur can produce a perfect chocolat under the guidance of our chocolatier. 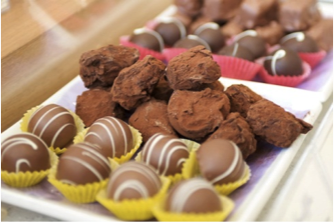 So far our chocolatier has guided chocolate lovers of all ages from early teens to mid-eighties through the course and every single participant has been delighted by the 30-40 truffles they have made with their own hands. Our courses are in central Cambridge, usually on the first Saturday of the month. In addition to a chocolate filled morning of fun, each attendee receives a certificate, 10% discount card, and a selection of our favourite recipes to take home as well. 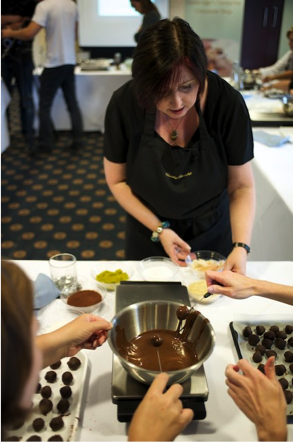 If you want to learn about the art of chocolate making why not book a course and join in the fun? Costs £55 per Person / £50 per person for 2 or more attendees booking at the same time. Chocolate Course Gift Vouchers available.